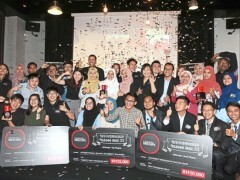 SIX students from International Islamic University Malaysia (IIUM) jumped for joy when they were named grand prize winners of the Nescafe Youth Entrepreneurship Programme (NYEP). They walked away with RM25,000. Along with the grand prize, IIUM also won in the Kahuna Mestros category in conjunction with International Coffee Month for selling more than 4,000 cups of coffee in October, taking home RM5,000. Tengku Mohd Hazwanhisyam Tengku Zulkarnaini, 23, said he was grateful that his team’s hard work had paid off. “We did our best, but winning this was beyond our expectations. “We want everyone, despite what they are studying, to have the opportunity to learn about entrepreneurship,” said Tengku Mohd Hazwanhisyam, a third-year law student from Ahmad Ibrahim Kulliyyah of Laws (AIKOL), IIUM. He said the cash prize would come in handy if they decide to set up a future business venture. “We handpicked our team members carefully. We conducted interviews with students who were interested to join the team as we only wanted the best for our team. “On an average, our daily sale was about RM700,” he added. Through NYEP, aside from receiving a start-up investment in kind, students were equipped with basic entrepreneurial, from learning ways to prepare and craft drinks to managing a business as well as developing promotional plans. 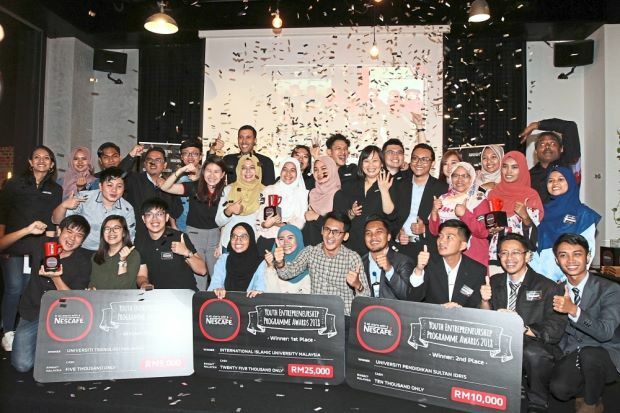 Nescafe Malaysia business executive officer Othman Chraibi said the whole idea behind NYEP was to help students and youth nurture and develop their entrepreneurial spirit and skills. “We provide experiential learning for the students in addition to their academic curriculum. “This year, we have gathered 10 universities in Malaysia and hope to expand the list of universities for NYEP to reach out to more potential young entrepreneurs in Malaysia. “We want students to be able to express their will to go beyond what they usually can and initiate their own entrepreneurship story. “The students have done the programme proud and even generated profits that were channelled back to their universities,” he said. Universiti Pendidikan Sultan Idris (UPSI) was first runner-up while Universiti Teknologi Malaysia (UiTM) was second runner-up.